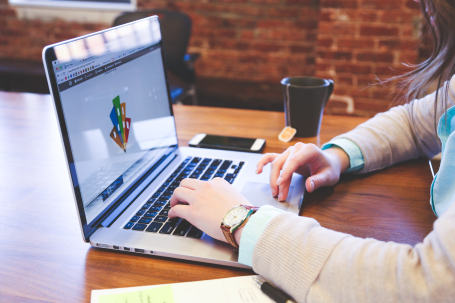 Website Design: How much does a professional website design cost? Our competitive website design, development, and management rates make staying within your budget a reality. We have identified site design and development processes that can be repeated and technologies that can be scaled at a known, average cost. Websites are free! Well, the ones you build yourself are “free”, or very close to it. That’s in terms of the setup costs of cut-rate hosting with low-cost providers’ least expensive plans, then using their free web building tools with a free template and free widgets and plugins and apps that come with them. What’s not free is the cost of your own time in trying to deal with all of that and run your business. The disappointment of a bad website lingers long after the happiness of a low price is forgotten. Don't forget these maintenance tasks, too! Feeling overwhelmed yet? At Webidextrous we understand completely that you want to spend more time on developing great products and serving your customers than on maintaining your website. That’s why we offer to do all these things so you don’t have to! What about drag-and-drop website design services? Drag-and-drop website creation services make it easy for anyone to build a website from beautiful templates. But, there are hidden costs to using these services. That is because as your business grows and you require more features than they can provide, you will have trouble migrating your site to something better. Drag-and-drop services don’t give the specialized support and service that Webidextrous will give you. If you decide to use a drag-and-drop service, you limit the potential of your site to react quickly to technological innovations. What about going overseas for talent? Obviously, web design costs are going to be higher in the U.S. because of the higher cost of living. Web designers in the U.S. have to eat and live somewhere just like anyone else. It seems wise to some business owners to go overseas for web development talent where the cost of living is lower. It follows that website development costs are lower. The main problem with hiring overseas website designers and developers for U.S.-based businesses is that of quality. Our experience with clients who have been hiring from overseas has not been a positive one in 9 out of 10 cases. Spelling errors, problems with content having inappropriate phrasings and idioms, and issues with coordinating project schedules over multiple time zones plague most overseas web development projects. One might say, “Aren’t all vendors essentially deserving of the same consideration in the bidding process regardless of location or culture or language?”. In an ideal world, we definitely agree! Think of it this way: If you run a group of real estate agencies in the U.S. and you need a web design that reflects the localities each agency serves, and you need the content to match the flavor of those areas, who is going to know better how to do that? An offshore website production firm or one in the U.S.? You would have the same problem if a U.S.-based designer tried to build a website for an overseas firm. Unless the U.S.-based firm has someone on staff who knows the overseas markets well, there is too much room for misunderstandings, assumptions, and cultural-incorrectness to occur. Yes, we all want to be part of a global economy when it comes to giving equal opportunity to a variety of vendors in a free market. The reality is often at odds with that feeling. In the end, you must make a decision about your website vendors that meshes well with your core customer or you risk losing business. The solution is not as simple as hiring only locally. We know because we’ve tried. For complex projects, where there are just as many talented people outside the U.S. as in, it is hard to justify paying more based on geography alone. And, even with all the problems described above, sometimes the person you need to work with used to live in the U.S. but is now taking advantage of the untethered lifestyle of an online profession. Your preferred website designer is traveling the globe, designing sites from coffee shops to pay her bills. That awesome PHP programmer is now an expatriate living in Ecuador to enjoy a more affordable economy. The wicked-smart e-commerce platform expert just moved to Australia to get married and make a new home there. It’s a new trend and we can’t fight it. We can only work with it. What we can do is manage it. Webidextrous manages all of this for you. No matter where we find talent, we seek only the best, the brightest, and the most capable. We help you avoid all the pitfalls that come with working across time zones. We navigate the cultural and linguistic barriers on your behalf. In short, you focus on your business. We’ll focus on your website. What is the most effective website management process? An effective build process is what sets real website development apart from drag-and-drop website builders. 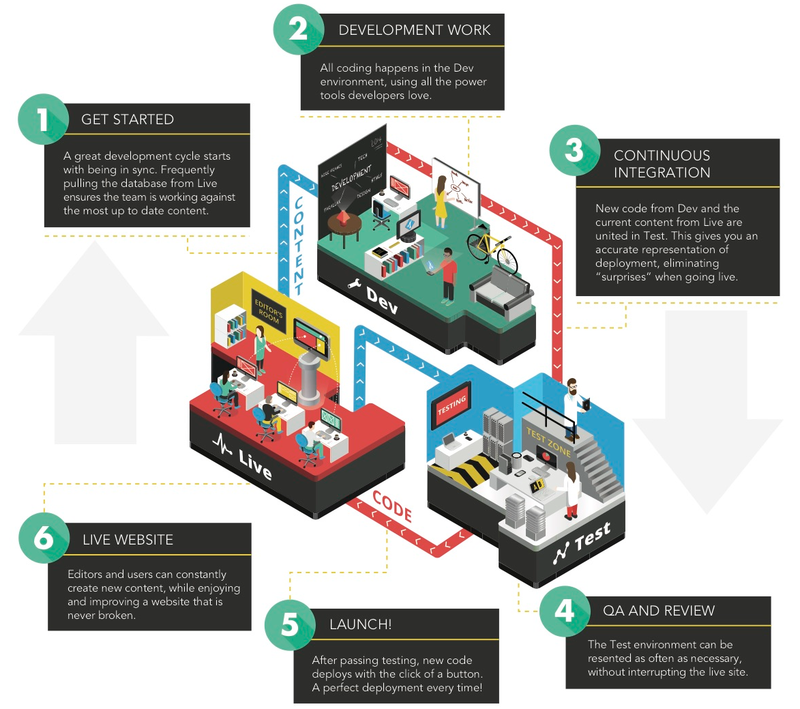 The most effective website build process involves, at a very basic level, something like the process shown in the graphic below. Imagine you want to make a non-trivial design change, but you don’t want your customers to know about the change until it’s complete and tested. It would be great to have another “sandbox” version of the site that you can play around with until you get it just right. Then, you can feel confident about making that new version of the site “go live”. With a drag-and-drop solution, you don’t have that capability. The changes you make are public, for the most part, if you don’t trust the “preview” function most of those services provide. 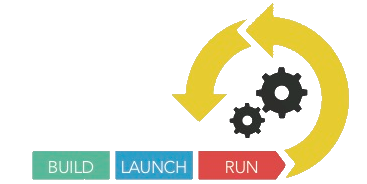 The most effective website build process involves, at a very basic level, a build, launch, run cycle like you see in the diagram below. More specifically, it is built on a development system, sent to a test system for quality assurance testing, and then published to a live or customer-facing system. Of course, Webidextrous will do all of this for you, so you don’t need to worry about it. You just tell us what you want to change and we’ll work on it on “Dev”, push it to “Test” and, when you’re happy with it, put it on “Live” for the world to see!